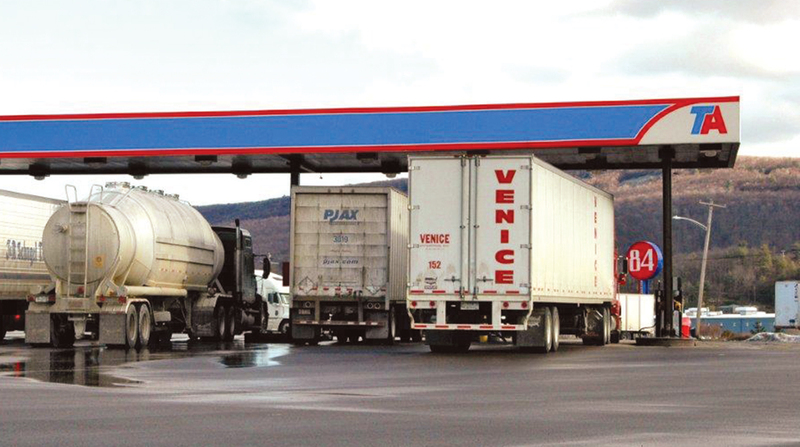 TravelCenters of America reported a net loss as revenue increased in the second quarter. For the period ended June 30, the company reported a net loss of $34 million, or 85 cents per share, compared with a loss of $3 million, or 8 cents, in the 2017 period. TA recognized a goodwill impairment charge of $51.5 million during the 2018 second quarter in its convenience stores segment, which increased its operating expenses. The charge reflected the amount by which the carrying value of the segment exceeded its estimated fair value, according to the Westlake, Ohio-based company. Revenue increased to $1.8 billion compared with $1.5 billion a year earlier. Fuel revenues reached $1.3 billion compared with $976 million a year earlier, primarily due to higher market prices for fuel during the 2018 period. The fuel gross margin per gallon slipped to 16.1 cents compared with 16.6 cents in the 2017 quarter. Fuel sales decreased to 551 million gallons compared with 552 million a year earlier. The company reported the fuel sales volume decrease on a same-site basis experienced during the quarter primarily resulted from the continued effects of fuel efficiency gains and increased competition, partially offset by the effects of its fuel pricing and marketing strategies. “During the 2018 second quarter, we continued to produce positive results from the growth and cost savings initiatives we have been pursuing,” CEO Andrew Rebholz said in a statement. “In our travel centers segment, each of nonfuel revenues and nonfuel gross margin grew at 5.5% and 6.7%, respectively, as compared to the 2017 second quarter, reflecting the continued growth in our commercial tire dealer, RoadSquad OnSite mobile maintenance, and RoadSquad roadside assistance and call center programs,” he said. The company also has begun to more aggressively grow its travel center network by acquisition, development and franchising, and through the introduction of its newly developed, smaller format TA Express concept that will be rolled out in the coming months.